For real, don't get too close to her with an open flame. 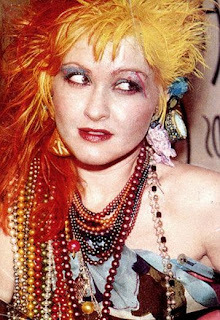 We put lots of things on our bodies in the 1980s. Things that nature did not create, nor ever intended. Things designed by scientists in labs. Terrible things. Dark things. Plastic things. Join me in remembering some of the biggest affronts to the natural order of things that were ever perpetuated in the name of fashion, won't you? These PVC plastic monstrosities were uncomfortable and stinky and unsupportive when playing kickball at recess. But they were cheap and sparkly and came in a variety of colors. Naturally, I loved them and wore them everywhere. And this pair can be yours on Etsy! Because they're so ... homemade? 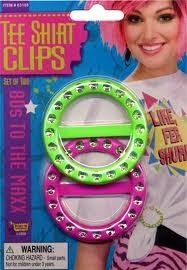 This all-plastic curved two-sided comb clip was the very best way to show off your rockin' spiral perm in the 1980s. Nothing looks more natural than a long, skinny explosion of hair running down the center of your head, amirite? Sorry, ladies. This item is sold out on Amazon. We liked our shirts oversized in the '80s, but we didn't want all that material getting in our way while we were ... umm ... practicing our sweet break-dancing moves? Yeah, I'm pretty sure that's why all the stylish ladies used t-shirt clips, plastic circles that let you secure your shirt to the side in a jaunty fabric tail. You can totally buy these, and just in time for Halloween! The best t-shirt clips came with utterly ridiculous fake rhinestones, obviously. Every week when I practiced my clarinet for the requisite 20 minutes a day, my mom or dad would drive me to F.F. Fatz, the most magical store in the mall. (It was named after the owner's cat, whose picture hung on the wall over the cash register. To this day, he is the coolest cat I have ever laid eyes on.) At F.F. 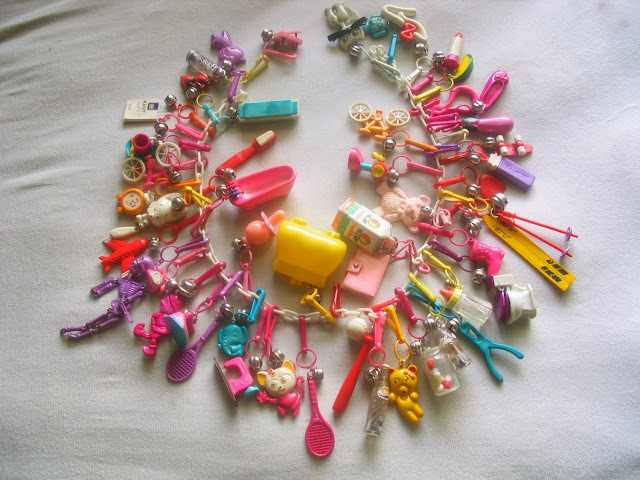 Fatz, I was allowed to choose one new charm for my clip-on charm necklace. And every week I was overcome with the total brain-melting awesomeness of this store, with its bin after bin after bin of colorful plastic charm delights. I would agonize over my decision about which charm would come home with me that week. The roller skates with moving wheels? The little purple airplane? The tiny harmonica? The refrigerator with the door that opens? The waving yellow dog? So many choices! So much goodness! Sadly, this Etsy item has already sold, but there are more out there if you search. Alas, my charm necklace has disappeared into the wilds of my childhood storage boxes. But I know it's there, waiting to be uncovered and worn again. A shirt that changes color when I touch it? Gnarly! I loved my Hypercolor t-shirt but didn't spend any time as a junior high schooler wondering how this miracle happened. Turns out, if you mix a few chemicals — some dye, some acids, a solvent — you could have a t-shirt that turns a different color when you put your hot little hand on it. 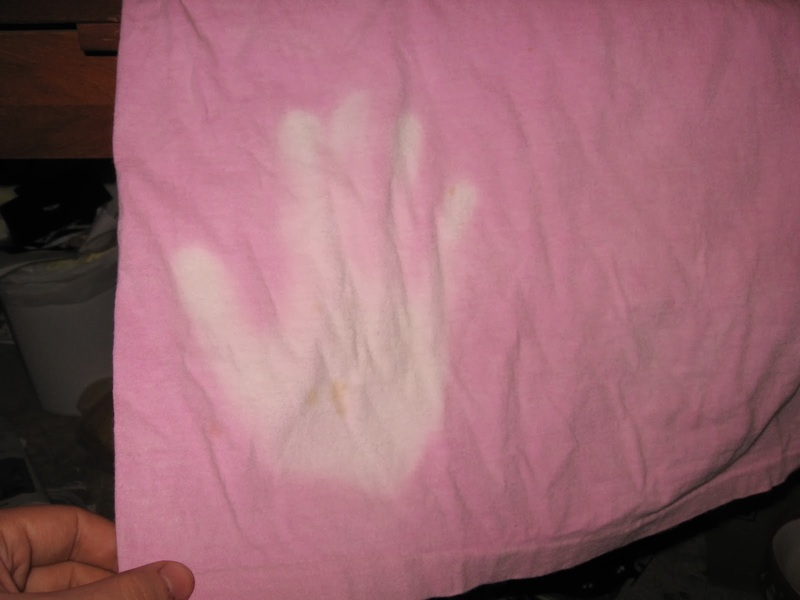 The increase in temperature weakens the microcapsules holding dye of a different color than the shirt itself, allowing the two colors to mix and leave behind a totally boss handprint in a completely different color. Thermochrome, the technical name for something that changes colors depending on temperatures, was where it was at, people. *OK, yes, Hypercolor clothing actually hit its peak for a few months in early 1991, which is technically not the '80s. But in the small Midwestern town where I lived at the time, 1991 may as well have been the mid-1980s, as slow as we were to embrace new trends. I mean, I tight-rolled my jeans until 1993, for heaven's sake. If you were like me in the 1980s, your wrists felt naked if they weren't covered in tons and tons of skinny neon plastic bracelets. 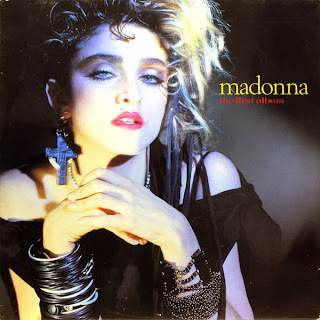 If they were good enough for Madonna, they were obviously more than good enough for me. OK, I've never read this book; I just liked the cover image. But I will totally read it if someone has a copy. Poor plastic jelly bracelets haven't done well in the new millennium. Remember, the '80s were a simpler time. A more innocent time. A time when pearl-clutching adults didn't latch on to what is most likely just an overblown urban legend. 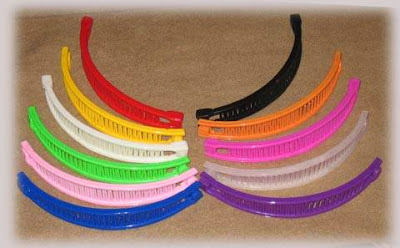 Let us remember the humble jelly bracelet as it was: A cheap, colorful, innocent fashion accessory that made our baggy neon t-shirts and acid-washed jeans look so much cooler. 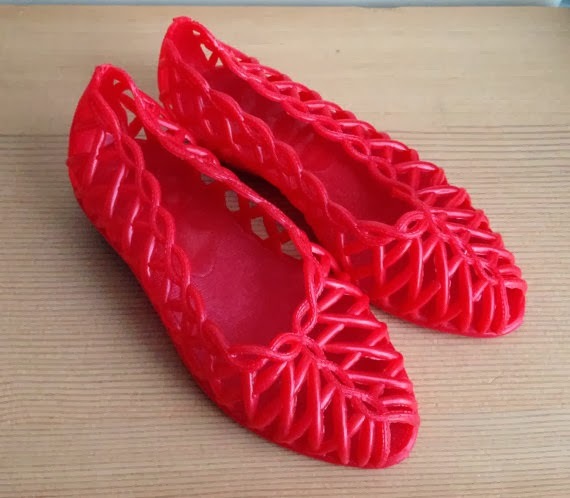 These little beauties were alllllllll plastic, baby. How could we have kept our math, history and social studies homework organized without them? And would our New Kids on the Block t-shirts have looked as good without some plastic Lisa Frank artwork clutched to our chests? Choosing the cover art on my new Trapper Keeper at the beginning of each year was possibly the best part about going back to school. See? All of these incredible 1980s styles, and not one of them naturally occurring. The '80s were clearly a time of colorful, petroleum-based accessories. And oh, how I loved them. What '80s accessory do you still miss? I had everything on this list. I recall wearing my Hypercolor shirt to a school dance. In hindsight, not my brightest move. The bracelets are still around - they are a fav party favor at the little kids b-day parties. 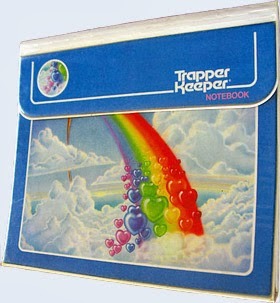 Trapper Keepers! Those were a must have. I do not miss stirrup pants. Also, the crimping iron was a horror. I also might have to put my hair in a side-ponytail, I'm feelin' all nostalgic. This is a stretch when it comes to accessories but I miss the Scholastic book order forms and the piles of books I'd bring home.